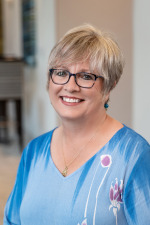 Christine received her undergraduate and graduate degrees from Clarion University of Pennsylvania and worked as a speech pathologist in the Pennsylvania public school system for 21 years. She has worked extensively with communication disorders in students K-12, including children with Autism Spectrum Disorders, AAC and multiple disabilities. Christine is passionate about communication especially in persons with autism. She consults with individuals and families in Northwestern Pennsylvania. Christine is a member of the American Speech Language Hearing Association, the Pennsylvania Speech and Hearing Association and NEA-retired. Financial: Christine Grubbs is contracted by The Center for AAC and Autism. Non-Financial: Christine Grubbs is a member of ASHA and the Pennsylvania Speech and Hearing Association. Christine receives free equipment from the Center for AAC and Autism to use for her presentations.